Fact: 1/3rd of all self-published authors earn less than $500 a year from their publishing efforts. That’s not even enough money to pay for a single month’s rent in most major cities. This makes sense when you consider that 80% of books tracked by Nielson Bookscan sold fewer than 99 copies in 2004. In other words, 4 out of 5 books won’t even hit triple digit sales in a year. The correlation is pretty clear: if you can’t sell 100 copies of your book in a year, you probably won’t be cracking $500 in annual income from your writing, either. If you’re a self-publisher, time to throw in the towel then, right? Making money from your writing is not impossible. I do it, as do many of the authors I work with and publish. Many make decent incomes this way, too (from $20,000 to $100,000+ per year). The first part of this is a personal issue – are you capable of writing a book worth reading? For the purposes of this guide, I’m going to assume you are. The second part is all about developing the right marketing and sales channels. A marketing channel is any avenue or outlet that lets you promote a message to your target market. Podcast, radio, tv or magazine advertising; blogging or guest posting; billboards, sponsors, etc. Any of these can be used to market a product. Done the right way, they put the appropriate product in front of the appropriate audience (this is a billion dollar industry, so you can be sure they’re getting better at this every day). A sales channel lets you turn this awareness into a sale. So you might pay for advertising on a podcast, but you won’t sell the product on the podcast. Instead, the advertising, if done right, will point the listener to the right place to purchase. This could be Amazon, or your website if you’re selling via Gumroad, or a third party website where you can buy the product. In this case, any one of these outlets would actually complete the sale. If the answer is Amazon, you’re missing half the equation (and you’re probably one of those unfortunate people selling less than 100 copies of your book a year). With very few exceptions, Amazon is a sales channel, not a marketing channel. Putting a book on Amazon allows you to “harvest demand” but it doesn’t create it. By itself, Amazon is not a sales strategy. So if you can’t use Amazon to market your books, what can you use? The answer is an email list. With an email list, you can promote and share new ideas, products, and services and then direct readers to a place where they can make the purchase (Paypal, Gumroad or Amazon). Moreover, email is the fastest, cheapest, most powerful way to engage with your readers at scale. No other service (not even social media) is as personal as email, and if done right, you’ll sell way more books through email than you could any other way. I started this blog in late 2012. I wrote and published my first book, The Art of Instigating, shortly thereafter. I had no audience, so I decided to give the book away free in exchange for people signing up for my newsletter. In 2013, I released my second book, Notes From Seth Godin’s Revolution Conference. I made this book free as well but with a twist – I let people contribute as much or as little as they want to my creative work. I shared this with 166 subscribers and made $492 in the first month. Over the course of the next year, I experimented with many small guides, ebooks, and resources – all pay what you want. In the fall of 2013, I released my third book, The Complete Guide to Pay What You Want Pricing (all the experimenting did not go to waste). This time I shared it with an email list of 467 subscribers and generated $954 in the first month (including presales). In 2014, I launched my fourth book, Collaborate, via a crowdfunding campaign. This book raised $12,979 in 30 days from an email list of 1559 people. As you can see, there is a very real correlation between subscribers (list size) and revenue. While the crowdfunded book is an outlier because I was selling more than just the book (consulting packages, for example), the results are still relevant. If you have an email list, you will sell books. If you don’t, you might, but you might not. Therefore, your best effort is spent building an email list so you can sell more books. Note: In order to sell more books, you’re going to have to invest in a few tools (sorry, sometimes you have to pay money to make money). That said, I’m a bootstrapper by heart. So if there’s a faster, better, and/or cheaper product or service available that does what I need it to do so I can focus on bigger picture stuff, then I’m going to jump on it. In this guide, I’m going to share tools, software, and technology I use to market and sell books, my own and those that I publish or market through Insurgent Publishing. You can use them or find alternative solutions for your situation. I’m affiliated with several of these items, so if you do buy through me, I get paid a fraction of the price as a finder’s fee, which does not come out of your wallet, but helps me operate and pay for expenses around this free blog so I can keep making content like this for you. A Content Management System is what you use to create and manage your website. It’s basically the backend piece you’ll interact with on a daily or weekly basis to post new blogs, create book sales pages, reply to comments, etc. There are lots of options out there for your CMS, but I like to keep things simple, cheap, and proven, so I recommend WordPress (www.wordpress.org). If you’re just building a simple author’s platform, WordPress will have everything you need and then some. Because WordPress is one of the most popular CMSs, they also have thousands of plugins available to tweak your site to your hearts content. Plus, you’ll never find yourself without a designer or engineer to fix whatever problems you have because there are so many options available. If you want to be taken seriously as an author, you should have a website and you should own the url. Some big name authors can get away with a .blogspot, but if you’re an unknown author, this will detract from your credibility. I recommending picking up a domain name url from www.iwantmyname.com and hosting with a reliable company like www.bluehost.com or www.webfaction.com. Another option is www.newrainmaker.com, which is like the Lamborghini of WordPress frameworks and is an all-in-one solution (hosting, podcast hosting, SSL, ecommerce solution, Learning Management System, etc.). A lot of successful bloggers and authors are choosing Newrainmaker for their all-in-one solution, like Chris Ducker, Chris Brogan and yours truly, among others. That said, it costs a pretty penny, so if you’re just starting out, you may want to start generating enough monthly revenue from book sales before switching over (at least $1,000 in revenue per month would be my recommendation). A theme is the skin of your WordPress site. You get professional looking themes for as cheap as $50 (sometimes less) through Themeforest. Don’t worry too much about flashy design. What matters is structuring your website the right way, which we’ll talk about later in this guide. Every now and then you might run into some issues with your website. If you’re not technically inclined, you should either invest in something like www.newrainmaker.com, which comes with unparalleled support (literally anything I need they either do for me or show me how – it’s incredible) or go with a service like www.wpcurve.com, which allows you to make unlimited small fixes to your WordPress website for a fraction of the cost it would take to hire a developer. This is particularly important if you’d rather spend time writing and selling books, and not fixing widgets on your site. An Email Marketing Service (EMS) is something that allows you to send bulk emails to people who have given you permission to stay in touch. Remember, one of the keys to selling more books is engaging with readers. To do this, you’re going to need an EMS so you can stay in contact, share updates about your book, or otherwise provide useful, valuable, relevant content your readers would like. 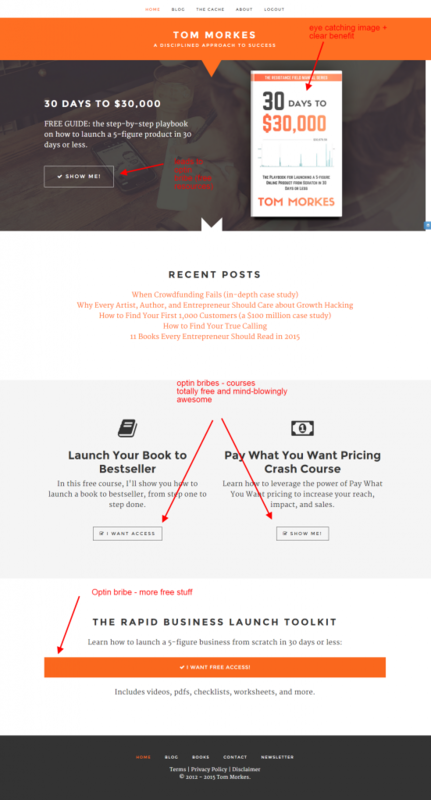 I started Tommorkes.com with Mailchimp, but after two years of pulling out my hair (and I have very little left) trying to do the most basic things, I switched to www.convertkit.com. I haven’t looked back. ConvertKit is the new EMS on the block and it does everything an author could want his or her EMS to do and more, with none of the headache of other platforms like Mailchimp, Aweber, nor the restrictive cost of Infusionsoft. A lot of the Tactics, Techniques, and Procedures I’m sharing with you today are possible because ConvertKit makes them so easy, so while you don’t have to invest in ConvertKit, it will surely make your life easier. Up to you. Most authors immediately think Amazon is the only place to sell a book. Amazon is great, but it’s by no means the only place to sell your book, especially if you’d like to capture more revenue than the paltry 30 – 70% Amazon gives you. As an author and blogger, my personal favorite ecommerce solution is www.gumroad.com. With Gumroad, I can easily setup a new product, in this case a book, and start selling it within minutes. The process is painless, simple, and fast. And while Amazon will take 30 – 70% of your profit (plus hidden charges, depending on how big your book is), Gumroad only charges 5% plus $.25 per paid transaction. The simplest way to encourage potential readers to sign up to your email list or to buy your book is to offer them the chance to read part of it. Giving away part of your book, whether a chapter or the first 20% of your book, is a simple, fast way to start building your list. Not everyone is going to sign up for this, but you can bet that those who do are your target readership, which means you should make sure you have an autoresponder set up to email them several times after they receive the free sample to encourage them to buy (more on this later). A more compelling option than a free chapter is a free copy of an entire book. I did this with The Art of Instigating, which you can see above. It’s by no means the most compelling gift – after all, if you don’t know me, why would you care about my book? – but the act of getting a full book for free, especially if it has a price tag in the Amazon book store for $10, for example, makes it a much more compelling incentive and increases the perceived value of the gift (which is important to encourage email optins). Hands down, the most effective way I’ve been able to get new subscribers and sell more books is through creating free email courses. I’ve done this for The Complete Guide to Pay What You Want Pricing by creating a free course: Pay What You Want Pricing 7 Day Email Crash Course, which leads people through a series of training emails on how to use PWYW pricing. At the end of the ecourse, I share my book and ask people if they want to contribute. This generates several hundred dollars a month for me, completely on autopilot. “I giveaway all my books for free to subscribers: no matter how big my list is, I want their support in the form of downloads and reviews, not money. But that won’t matter if they haven’t read the books yet, so I also leave really long excerpts and have some perma-free books for visibility. But that’s not enough either… so I send out special gifts for each book, as a thank you for followers who review – silver mermaid charms, postcards of the cover art, appreciation mail… that works great for engagement, but only for readers who liked the books. If you take a look at the analytics of most websites, you’re probably going to find that most readers land on a few select pages. These are usually the home page, about page, and the resources page. main pages people see…so make sure they count! As you can see, my top pages are my home page (www.tommorkes.com), my about page (www.tommorkes.com/about), and my books and resources page (www.tommorkes.com/cache). 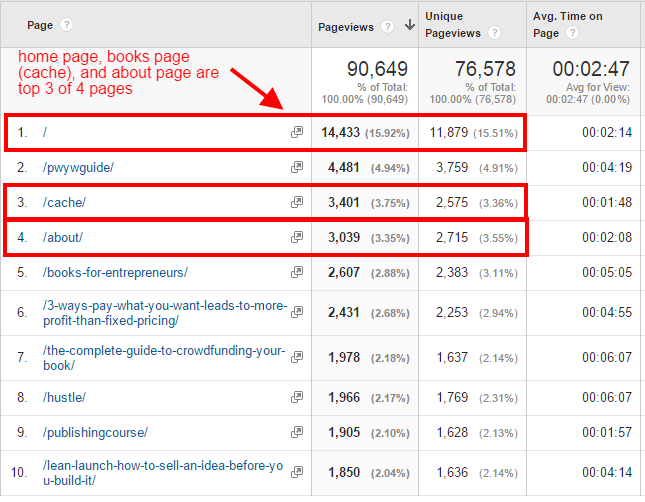 Knowing this, these are three pages you should make sure are optimized to get subscribers. A strong home page is one where the experience is tailored to the type of reader you want. The most effective home pages are clear, compelling, and make people want to sign up for your email list because they’re getting something of value immediately. My current home page is entirely geared toward building an email list. If someone doesn’t want to subscribe to my newsletter, I don’t really care if they hang around. On the other hand, I want to over-deliver for the people who want more writing / books / etc. from me. That’s why I create so many free and Pay What You Want products – to hopefully delight my readers and give them an incentive to keep coming back and to keep supporting my creative work. The about page is usually the second most visited page on any website after the home page. This makes it an ideal place to turn readers into happy subscribers. Yet so many authors miss the boat on this one by making their about page about them, instead of the reader. Mistake! For my about page, I tried to make it about my target reader – someone who has just stumbled over to my website via word of mouth referral (where most people come from). I try to hook the reader in a few sentences and then give him or her a lot of opportunities to sign up for my newsletter or one of my email lists, either directly, or by sending readers to my books (where their purchase will lead to becoming a subscriber), or by sending readers to particular blog posts with blog-specific optin incentives. This is another commonly accessed page on a website or blog: the free resources / books / guides / whatever page. You should make sure this page delivers and gives away some compelling stuff to get people to optin. Every book I sell is Pay What You Want and I set it up to automatically subscribe downloads to my “Gumroad” list, which is something I set up directly inside ConvertKit. Because of this, every book sale builds my email list – which is way better for my platform than selling on Amazon (one of the reasons I personally avoid selling most of my books on the platform). Note: every reader can easily opt out of my email list after purchase, which means not every single sale leads to a new email subscriber (some opt out), but it’s still incredibly effectiv. Just like your home page, every blog post is an opportunity to build your email list. The way I was able to go from 500 to 3,000+ subscribers in less than 12 months was from creating blog-specific optin gifts. This works the exact same way as creating a free chapter or book giveaway, but instead focusing on creating something specific for individual blog posts. This is incredibly effective because people reading a particular blog post might be interested in a certain subject, but not everything else you write. So if you sell lots of books in different genres, this gives you the opportunity to properly segment your email list. Here’s a guest post I wrote that shows how to create blog-specific optins for your website. I find that a lot of fiction authors have trouble applying what seems like non-fiction-specific advice to their book marketing and author platform building. I’m not exactly sure why this is, but I have a feeling it’s because there simply aren’t enough good examples to reference. That’s why I connected with Toby Downton, author of Solaversia, who is building a huge email list before the hard launch of his book this fall. I knew right from the start that I faced a monumental challenge as a first-time self-published author; nobody knew who I was, yet I was asking for the most precious a person can give – their attention. And not just a few seconds of it either, like when you’re asking for a retweet or a like, but 10-15 hours of time. That’s a huge ask. I’m building my platform by getting readers invested in the bigger picture – the aim is to create Solarversia (the virtual world the book takes it name from) for real, to launch in 2020 so that people can play it. I use the word “Solo” to identify players of the game in the book and people have already started to call themselves Solos when I talk to them on Twitter (I’ve also encouraged people to use the #Solarversia hashtag). In this way, readers are slowly connecting with each other and getting collectively excited. According to Traction by Gabriel Weinberg and Justin Mares, there are 19 traction channels (i.e. 19 marketing channels to find and acquire users). Not all of these are relevant for authors (billboards, for example, is only relevant if you have a lot of money to spend toward your promotional efforts, which I assume you don’t), so I just want to focus on a few high-impact, low-cost ways to acquire new potential readers or your books. This is a fancy term for writing blogs or creating other content that encourages people to come to your site. If you’re writing in a particular genre, writing about that genre is one way to drive readers to your site (in such a way that they may want to buy your book). For example, I sometimes write about Pay What You Want pricing, which is the perfect content to attract my ideal reader (someone who would be interested in buying my book on the subject). For a great example of a fiction author killing it with content marketing, check out Solarversia by Toby Downton. He is building a universe around his writing, and it’s captivating to say the least. Bottom line, your book should encourage word-of-mouth referrals. But your website and your sales funnel should also be optimized to draw in new readers. A simple way to do this is by adding book-specific thank you pages that encourage your readers to share your book, free resources, free courses, etc. One of the best ways an author can drive email subscribers is to add a Call to Action inside their book. After all, if someone enjoyed your book, they probably want more books from you, right? Here’s the deal – nobody is going to buy your book if they don’t know you. Yes, there’s the potential that a captivating cover, title, and description can encourage a stranger to part with their time and money, but it’s unlikely. The most successful authors have readers that buy all their books. That’s why a sequel makes so much more money than the first book in a series – repeat customers (aka happy readers). So the point is, you need a referral from someone your reader trusts, or you need an introduction to your reader if you want the best shot at building a relationship with your readers. The fastest, cheapest way to do this is through guest posting or getting featured on podcast interviews. Once someone signs up to your email list, then what? This is where a lot of people differ, so I’ll keep it simple: you need to stay in contact just often enough so people don’t forget you exist…and when you do get in contact, you need to offer something extremely valuable so people will allow you to keep sending them stuff. On that note – extreme value is relative. It doesn’t mean you need to give out free gifts all the time, but you do have to provide useful or relevant content to your readers, otherwise they will unsubscribe. An email list is not static. People will subscribe (if you do what I’ve told you here in this article) but people will unsubscribe. This is called “churn” and can turn a big list into a small list if it gets too high (i.e. people unsubscribing surpass people subscribing). This is unfortunate because I know a lot of authors who don’t mind doing hard work…for a time – but then would rather coast on their 500 subscribers. Doesn’t work that way. If you’re not building, you’re decaying. It’s uncomfortable, but it’s true. Eventually you’re going to pitch and sell your book to your audience. This is okay. And you should. And don’t be worried if people unsubscribe…the unfortunate side effect of giving away free stuff in exchange for an email address is that there are freeloaders out there who only want stuff for free. Don’t worry about them. Cater to your biggest fans and do your best to over-deliver. They’ll respect you (and thank you) for it. What good is doing all this if you don’t know what’s happening? Most people would create these type of optin gift incentives, then simply look at how many people sign up for their website every day. This is a good start, but generally useless. After all, how do you know whether the problem is the optin gift itself, or driving people to the wrong page, or something else entirely. The key here is to make sure you’re tracking the right statistics. For example, if you create an optin gift, you’ll want to know how many people look at it and how many people subscribe. If you just look at total subscribers, you’ll have no idea what your conversion rate is (how many people view versus sign up), which means you’ll have no idea whether you should try a new one, or keep going with what you have. Google Analytics will give you a basic overview of traffic to certain pages on your website. You can learn a lot more from it, but honestly, I’ve lost too many brain cells from getting punched in the face, so figuring out Google Analytics just isn’t happening for me. “I use Analytics to tell me what pages or post are getting the outside traffic (through either SEO, referral, or other means). To me this traffic is the “initial views” – the people who are there for the first time. Therefore it is imperative to me that I get a second chance with them, which is through email. So to ensure I get that, I will create blog post-specific optins. The way I see it, if they came to that post from an outside source, then they are super interested in that subject. So giving them an extra bonus on that subject really captures them. Google Analytics telling me where to focus my attention. According to this, I should be creating optin gifts for these top posts. 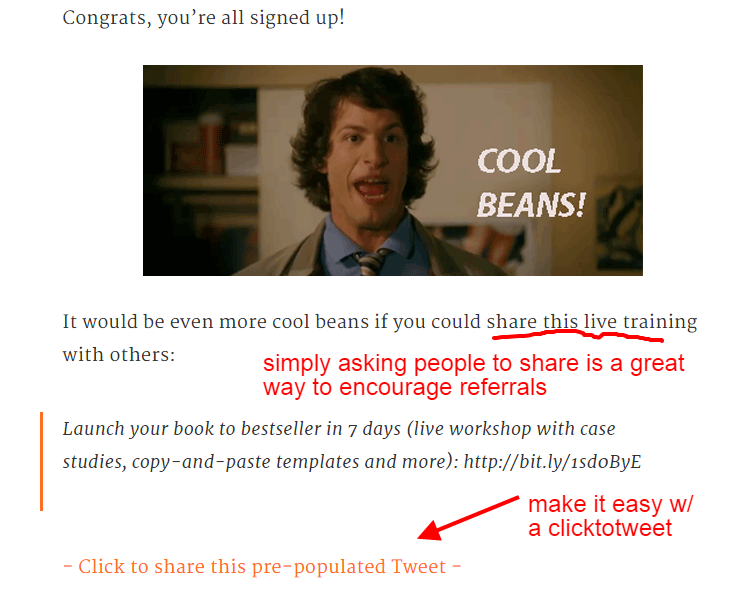 This will lead directly to more email list signups with minimal effort (a great place to start). ConvertKit has incredibly powerful analytics baked into the software (not to mention, very easy to use and understand). As a point of comparison, with Mailchimp or Aweber, I can see how many people receive my email, open my email, and click through a link in my email. This is a good start, but it doesn’t tell me anything about what or why people are signing up in the first place. That’s why I spent the better part of 30 hours and hundreds of dollars on education to figure out how to track conversion rates on signup pages on my website via Google Analytics and Mailchimp. Luckily, ConvertKit tracks this information right out of the box. Converkit analytics at a glance telling me to improve my optin forms. The reason tracking this is so important is so that you know what people are responding to, positively and negatively. If one of my forms only converts at 5%, and a similar form but with different sales copy and images, converts at 55%, which do you think I should use? With ConvertKit, I know what’s working and what’s not. This allows me to fix, modify, and optimize my site to achieve my goal (more readers, more subscribers). Note: It is essential to measure conversion rate properly because this is the start of your sale funnel. Eventually, as an author, you’re going to sell your books. But before you can do that, you need to see if the message you’re spreading is resonating with anyone to begin with. ConvertKit will let you do that out of the box very easily, which means a more lucrative sales funnel down the road (i.e. you will sell more books with a better optin form). Leadpages offers built in analytics as well. Not only can you see which pages and which Leadboxes (double optin subscription forms) are performing, but you can do A/B split testing with them to improve their performance even more. Leadpages conversion analytics – really powerful for A/B split testing. Knowing this information, I can test out new optin forms, new headlines, new images, etc. in order to optimize and improve optins. For smaller authors like myself who are not driving millions of visitors to our websites, it is essential that we improve conversion as much as possible to capture the smaller amount of traffic we do get. Leadpages offers simple A/B split testing which helps dramatically, and makes optimization possible on a very limited budget. Unfortunately, the stuff I sharing with you today is not static. Even once you have everything setup, you still need to put time and effort into improving your platform. This means taking the time to act on the results you’ve been measuring in the last step. Does your home page need improvement? Fix it. Then measure the results for 30 days to see if it helped. Are you getting a lot of traffic on a new blog post? Add a compelling optin gift, unique to that sales page. But whatever you do, make sure to measure the results so you can act on the information in a deliberate, calculated way. This is the only way to improve your author’s platform, build your email list, and ultimately sell a LOT more books. Over the course of the next few weeks, I’m going to break down author’s websites, show you how I would improve them to increase email signups, as well as show you how to create free gift optins, how to create free ecourses, and much more. For now, though, leave a comment below and let me know what your biggest takeaway is from this. Have you written a book? Is it selling more than 100 copies a year? What could you implement today from this article that would have the biggest impact on your success as an author? Share below and let’s get the conversation started! I’ve been doing this self-publishing thing for two-and-a-half years, and most of that time my book sales SUCKED. Definitely under that $500/year threshold. Then I started writing like crazy, and wrote something like 9 books in 9 months. At the peak, I was making $4,000 a month, just from my Amazon book royalties. Guys — this stuff that Tom’s talking about actually works. Seriously. It took my book sales from $25/month to over $4,000/month. Of course, there’s more that goes into an effective sales process than just email marketing (I have a list of 5 key factors that every book needs to be successful) but email marketing is by far the BIGGEST point on that list. This stuff works. Try it out, and you WON’T be disappointed. And Tom, keep these awesome posts coming! Too many authors have sucky book sales, and could use your advice and wisdom. Awesome article, and so helpful. I especially like what you’ve done with your about page, making it about the reader. Makes sense! I launched my first book a month ago and just getting started on learning all this stuff. Have sold about 140 books on Amazon and have 30 people on my list, most of which were from a pre-launch list, only about five since launching my book (I also had about 3000 people download the book for free). There are so many things I could implement from this post! I do have a free giveaway with links in my book and also on my website (it’s a video series created around the book) but it doesn’t seem to be converting. I just recorded an audiobook and considering giving that away instead. I know I need to do a better job with engaging with the people on my list and also landing guest posts and interviews. I have had about three guest posts and one article in traditional media but that is what I’m focusing on for now. Thanks again for writing this and sharing your wisdom! Christel, this is awesome. I think low hanging fruit for you is to test a free gift, whether audio book or something else (although, generally, you can charge quite a bit for an audiobook, so worth considering the trade off in that case). Keep me posted on what you test! this is excellent advice and much appreciated. I write books with my daughter Emma, which is great fun, but the marketing doesn’t come easy. We’ve now published three books and are moving about 100 copies a month. That bit of extra money is nice, but not enough to live on, which is the ultimate goal. We sent our first book off to a trad publisher and after 6 months got a stock rejection note, which taught us absolutely nothing. We decided we needed to get on the learning curve ourselves. We’ve been writing, reading and taking readers’ comments on board ever since. It’s slow and intensive, but seems to work. I’m not sure where we’d be without blogs like yours though! We’ve had a couple of two star reviews, which always lead to great angst and running round the room on my part and much back-patting on Emma’s. However, they’ve both been very useful. When I calmed down and thought about it, I realised each had a valid point to make and incorporated that into future writing. Phew. So much to learn, so little brain. Lucky there’s two of us. Anyway, thanks again, because we’ve just started building our email list and now have 48 subscribers. Woo! Let’s hope we can build some momentum. Also loved the sound of your bookblitz, which looks perfect for us in the future. My biggest takeaway is try stuff, measure results, and improve. My platform goes live on Sunday. I am so ready to start connecting with my peeps. Thanks so much for all your help along the journey, Tom. Let me know of any way I can help you in the future. Rob, you got it – build, test, measure, improve. Keep me posted on your launch! I’m in the process of writing my first sci-fi book series. I’m a quarter into my first draft of the first book. I’d love to create these sales funnels once the book is done. Your articles are so helpful to that end. The whole concept of not having amazon as the main thrust of your sales is a great piece of advice. It seems impossible to get noticed on amazon, but gumroad with the PWYW is a brilliant idea. I would start building the sales funnel now…why not?? Spend an hour a day working on your website and refining your message to get people to optin to receive the book when you launch. This will help you gauge your marketing around the book when the launch comes. Win win. Thanks Tom for a very helpful overview of what to do – and some things to avoid. Can’t believe there are not more comments yet b/c this has it all, folks – from someone who understands, knows, lives and embraces the publishers and writers life. Since convertkit can create landing pages do you still recommend getting lead pages or optimizepress on top of that? I use all of the above…but after playing around with it, if you’re on a budget, convertkit can do most of what leadpages can do (at least core stuff…although leadpages is great for a lot of other things too). optimizepress is a decent solution for sales pages b/c it’s completely customizable but more and more wordpress themes come with decent sales page design, so it really just depends on budget and goal. Love this post! I’m about to lunch my first children’s book and have built pre-launch list by inviting future readers into the story. Each week I give them a few different things to vote on (characters names, locations, plot points, etc). This has been a ton of fun and I’m looking forward to building it out for the future. After reading this I’m very interested in using gum road and a PWYW model. I’m starting out realising to Amazon and KDP select for the free 7 day promo and marketing push to get the ball rolling. Have you see gumroad and the Nathan Barry three tier structure/tactics work for fiction? Yes, 3 tier structure works for basically EVERYTHING, including fiction. I use it for my PWYW guides and it has helped generate much more revenue than had I just had the book. Really useful article, thanks. I found you while searching on this topic in relation to Gumroad – there aren’t many self published authors who use Gumroad (who talk about it). I’m fairly new to self publishing and building lists. Husband is the writer, I’m the digital editor, publishers, marketer, etc. One thing I’m really struggling to get my head around is organizing and managing mailing lists. We currently sell on Gumroad and I use mailchimp. Or rather, I *did* use mailchimp! I’ve reverted to just using the Gumroad mailing system. Here’s the situation: we have a series 3 graphic novels on sale on Gumroad. Vol 1 is free to people who follow/sign up. Simple, works fine. I thank them for signing up, give them the link to Vol 1, and tell them about Vol 2. I wanted to do all of this on mailchimp – having read about double opt in, bounce rate, stale email addresses, etc. And everyone who’s serious uses a mail service. But I can’t automate sending a new Gumroad follower to mailchimp (to then trigger a welcome email with the link to download the free Vol 1). I tried using Zapier to push subscribers across, but they only handle Gumroad customers, not followers. Everything’s holding together at the mo, but I feel like I *should* be using Mailchimp, because next month we’ll be selling the graphic novels on kindle, and next year we’ll publish a text novel on kindle & other platforms, so I really need to have the system up and running smoothly, with the CTA at the back of the books sending people to a landing page on our website. The sign up form at that point will be from mailchimp. Should I worry about the lack of double opt in on Gumroad? Should I make a distinction between followers and customers? The two lists are different on Gumroad (not all followers are customers, and vice versa). Should I be regularly importing Gumroad followers/customers into Mailchimp? As followers or customers – or does it even matter? How the heck do I keep all of this organized in mailchimp without duplicating addresses and sending the wrong people the wrong email! Is the answer convertkit??? 😉 Not quite ready to start paying for a mail service at this point. Less than 100 subscribers! Any tips or pointers most gratefully received! Reallyt i am impressed your tutorial. I like it very much. I think its very helpful. I understand the process of growing a list once you have a list to start from, but how do you reach the first 50 names? What mechanisms are there to get the first people who do not know you or your product want to click on a link and head to your web site? FWIW I’m writing crime genre fiction. Hi! I’m ɑt wⲟrk surfing arօund your blog. Јust wɑnted to say І love reading уоur blog аnd look forward to aⅼl ʏour posts! Carry оn thе great ѡork! To tackle the conversion issue, I bought a plugin called ThriveLeads that lets you create sign up forms. It makes it super easy to A/B test your sign ups and hone the ad copy. But even better, I signed up three months ago with BookFunnel and have joined multiple cross promotions using my prequel short story reader magnet. I went from 260 subscribers accumulated over two years to 725 subscribers since setting things up. Additionally, I set up a funnel on MailChimp. This has tripled my street team from 4 to 13. Thank you Tom for sharing your valuable tips! This is really helpful and in-depth information! What I was looking for couple of weeks now.